We have been seeing a bit more of Krypton this month what with Supergirl #0 and Superman #0 being primarily set on the planet. We also witnessed the clone uprising in Superboy #0 as well. 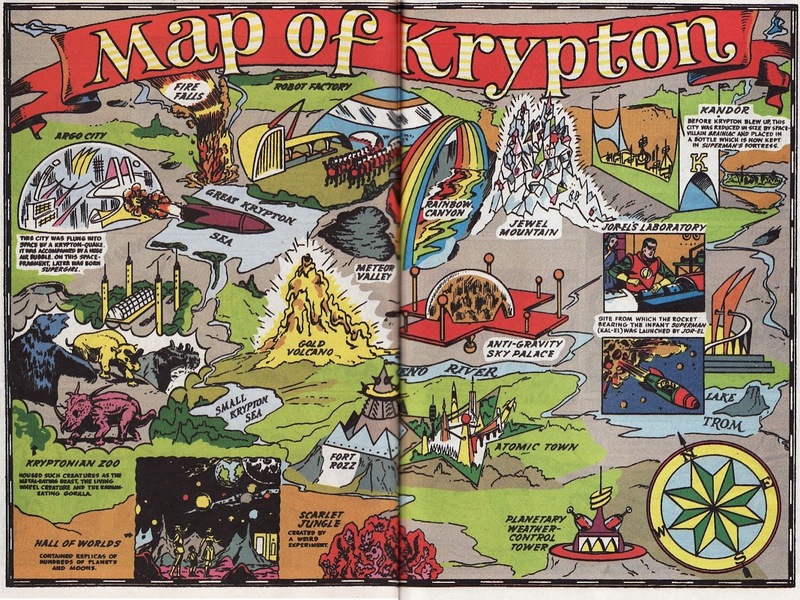 With that in mind I thought I would post a Silver Age map of Krypton. I think it is pretty interesting to see how many of these Kryptonian landmarks and ideas have survived over time, having been utilized in the pre-Crisis world, the Modern Age of comics, and now the New 52. My favorite landmark on Krypton has to be the Fire Falls. I covered some of the more memorable and recent Fire Fall stories over time on the blog. You can get to those posts here. 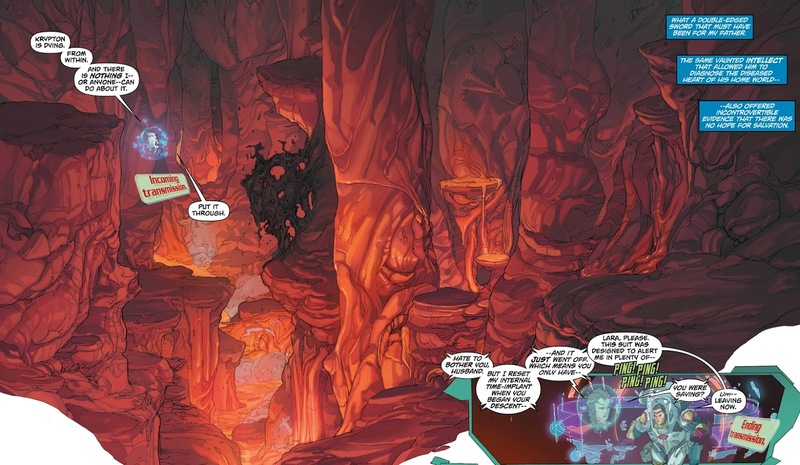 The Falls have survived all the ages and were just seen in June in Supergirl #10. Argo City also has had a pretty storied comic history. 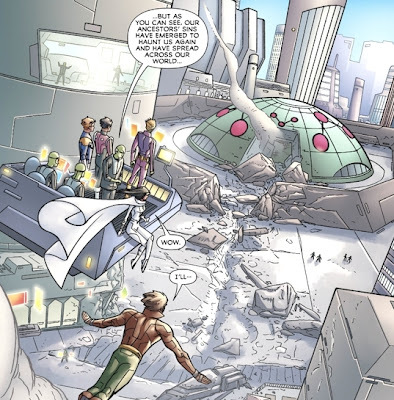 The concept of Zor-El encasing the city in a shield to survive Krypton's destruction has also survived the various reboots the DCU has gone through. And even the shrunken city of Kandor in the end has been seen in the Silver Age, Modern Age, and DCnU. Fort Rozz was seen last in the New Krypton story arc as being a citadel/jail that was flung into the Phantom Zone in its entirety. And the concept of 'weather control towers' was seen just a couple of weeks ago in Superboy #0. I guess if I am a proud enough geek to have a favorite Kryptonian landmark then I should be proud enough to admit I have a second favorite too. There will always be a soft spot in my heart for the Scarlet Jungle, only because of the great Alan Moore story in DC Comics Presents #85. 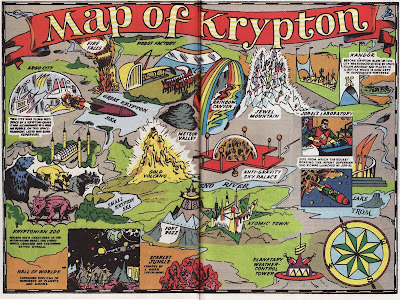 I found this map in reprinted Superman Annual #1. The reprint was released in 1998. The original was published in 1960. Will other parts of historical Krypton be seen in the DCnU? Does anyone else have a favorite spot on Krypton? 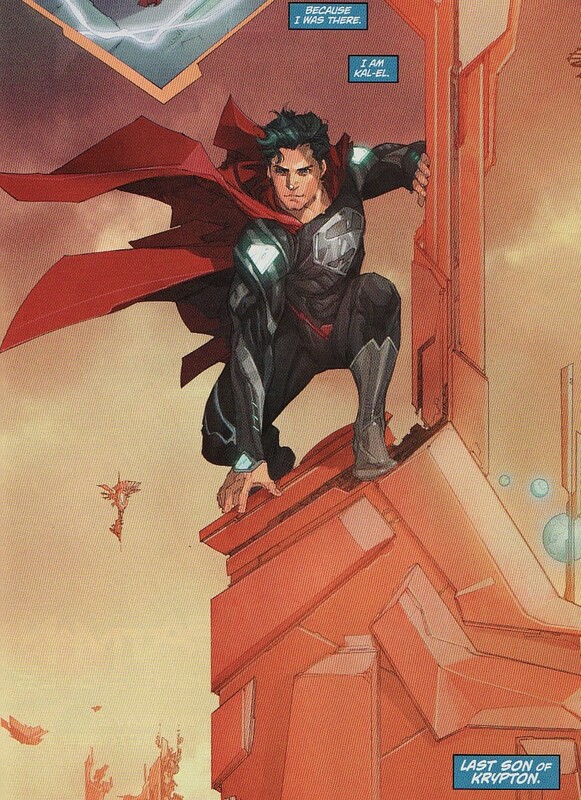 The third new era of the DCnU Superman comic began this week with the release of Superman #0 by new creative team writer Scott Lobdell and artist Kenneth Rocafort. After George Perez and Dan Jurgens led arcs, hopefully DC has found the right creators to bring this title to the where it needs to be. 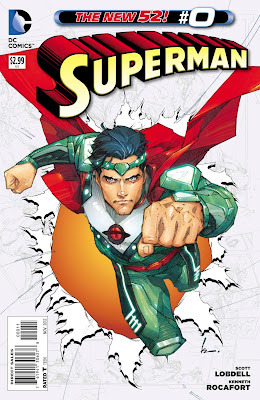 Now we got a taste of Lobdell's vision of Superman in the Superman Annual #1 earlier this summer. And we get an even smaller taste of Superman here in this zero issue which is mostly a story about Jor-El and Lara back on Krypton. 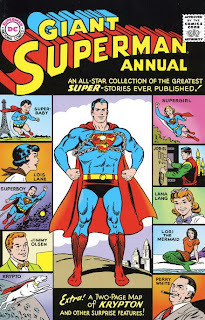 Like many of the zero issues, this one concentrates on the origin of Superman but here it is the historical aspects that lead to his rocketing to Earth. Since we know that the major aspects of the origin are still set in stone - 'Doomed world. Desperate scientists. Last hope.' - Lobdell looks farther back, back to when Jor-El first learns Krypton is going to explode, when Lara first discovers she's pregnant, and when Krypton was politically unstable as the planet core. 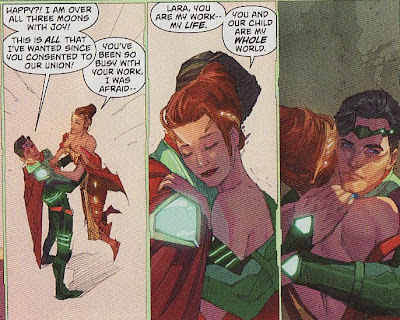 The issue gives a nice look at DC's true power couple - Jor and Lara - and it certainly plants the seeds for future stories. 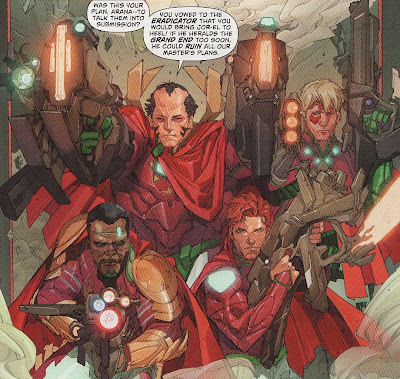 I have always loved Kenneth Rocafort's stylized art and it works very well in this issue. In particular, the panel construction works very well. When the action is calm, the panels are orderly and composed of right angles. When the action becomes chaotic, we have a variety of polygons for the art. It echoes the story nicely. But as I said, the best thing about this issue is the look back at Krypton culture and the hints at some hinted at plot elements impacting the current Superman mythos. In a scene that nicely echoes the opening scene of Superman:The Animated Series (which you can watch here) the issue opens with Jor-El deep under the surface, confirming his worst fears that the planet is doomed. When Lara calls him to say that it is time for him to return to the surface, Jor-El doesn't tell her his results. As we saw in Supergirl #0, keeping that secret can't end well. But Jor and Zor aren't exactly alike. Interesting to see that the narrator of the story is Superman. 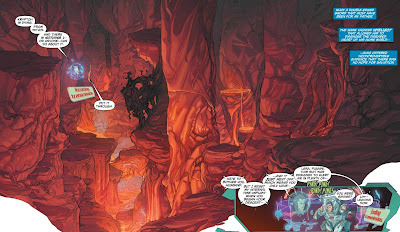 Nice panorama here by Rocafort, made all that more beautiful by the colors of Sunny Gho. Going deeper, into the 'middle of the planet', Jor stumbles across some sort of den. He comments that this is such a harsh environment that even he can't imagine what could survive here. So here is the first hint at a future plot line. Whatever could live there might have survived the eventual destruction of the planet. Is it H'El? Is it some sort of Doomsday? Some of the greenish sludge seems sentient down here and contact with it begins to disintegrate Jor-El's safety suit making him need to beat a hasty retreat to the surface. That attack also mirrors S:TAS nicely. It also shows just how far Jor-El will push himself for knowledge. He is something of an action scientist (if I can borrow a term from Atomic Robo). Dejected that his superior won't let him discuss his findings with the Science Council, Jor-El heads home to see Lara. She wasn't supposed to be home, having made earlier plans to hang out with Alura and Kara but she stayed home to give her husband some big news. She's pregnant. I love that last panel. While thrilled that he will be a father, he is weighed down by the knowledge the planet is doomed. Rocafort's expression is perfect. You can see the sort of resignation and sadness on Jor's face. Still, he doesn't tell Lara. From a Supergirl point of view, I found the throwaway comment about the 'girls' night out' for Lara, Alura, and Kara important. 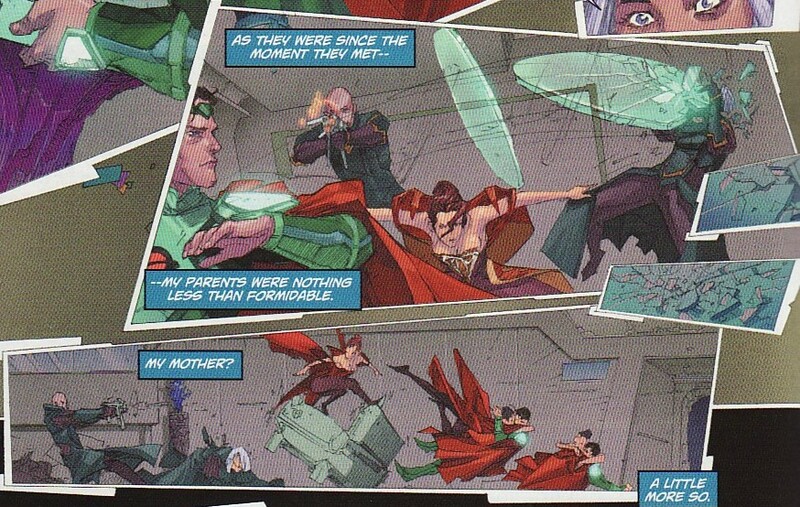 It shows once again that on Krypton, Kara was devoted to her family, would hang out with cousins and aunts and parents. Hopefully, that sense of family will be there on Earth in regards to Kal. We saw in Superboy that after Kon's clone revolt, a 'doomsday cult' emerged hoping to hasten the destruction of Krypton. Here we see just how powerful that terrorist group was. They destroy the Core Research Center, the lab in which Jor was researching Krypton's instability. Suddenly his information and allies are lost. What's worse is they bring their zealotry to his home. He needs to be silenced to. When he runs to warn Lara, he finds some cult members in his house. Now initially, I wondered why this group would enter the house and monologue about their plans to kill him rather than just do it. Heck, if they exploded a whole science facility why not just blow up this one house. To get around that, Lobdell has this group's leader have a history with Jor-El. Here, Arana talks about their 'sweat soaked nights' together in omniversity. He really is an action scientist. But Arana's obsession with Jor-El at least explains this early posturing. Maybe she is trying to covert him. If there is one thing that I really liked about this origin issue it is that Lara isn't simply a doting wife. She is as accomplished and strong (if not more so) than Jor-El. She is a physician, a lab scientist, and a military trained combatant. She impressively batters the terrorists. It is a nice moment. Lara is the fighter of the two. But they are true equal. With her boys nursing their injuries, Arana calls in some back-up. This was another of those moments where some information is revealed, more for the future than effecting the outcome this issue's story. The leader of this cult is called The Eradicator and he doesn't want knowledge of Krypton's destruction given to the populace. The original Eradicator wanted to maintain a pure Kryptonian culture and part of that was making it impossible for Kryptonians to survive off-world. So a new Eradicator bent on not letting Kryptonians leave the dying planet is a nice wrinkle. After defeating the new troops by sending them to the Phantom Zone, Jor-El tries to pry some information from Arana. Was the Doomsday Cult responsible for the planet's death. I am sure that Doomsday is in bold for some sort of reason. Is Doomsday going to exist in the DCnU. But even more crazy is Arana's response. This cult doesn't just want planetary genocide. It wants 'cosmicide' to occur. Does this cult want to bring about universal destruction? And how will that accomplish that goal if they all die when the planet goes? Before Arana can kill Jor-El, Lara arrives brandishing a spear. Lara stabs Arana incapacitating but not killing the cultist. But, like any good cultist, Arana has a suicide device on her and vaporizes herself but not before telling Lara that the planet is doomed. I have to say, this was the one part of the issue that I didn't particularly like. 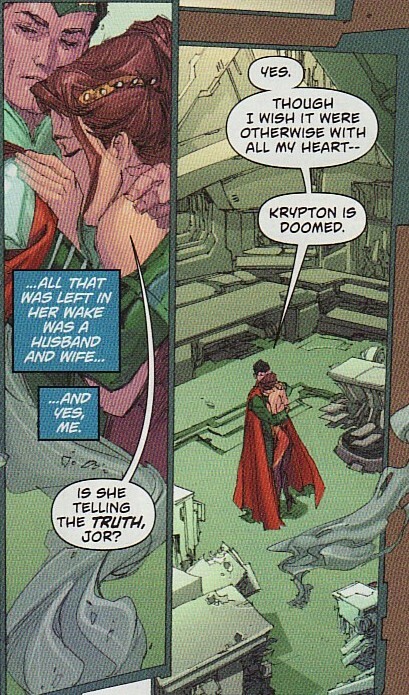 We will never know if Jor-El would tell Lara on his own that Krypton is exploding. Instead he has to react to the reveal. Wouldn't it have been a better moment if Arana dies, Lara asks 'what was that about? ', and Jor-El takes a big breath and tells her on his own. Wouldn't that differentiate him even more from Zor-El? Wouldn't it show how much he treated Lara as an equal, someone he felt could handle that information? As for those narrator boxes? 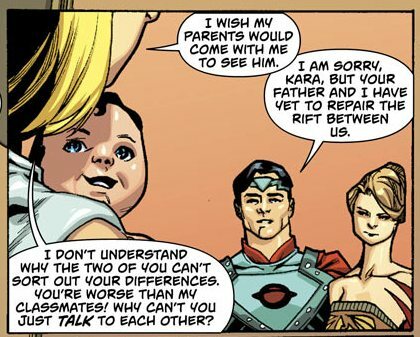 Well the reason Superman can talk about his parents like this is that he is observing them on Krypton! So we have had Supergirl seen in Superboy's origins on Krypton. We have seen Superboy in Supergirl's origin issue. And now Superman on the planet. Could H'El have this power? To send people in time? Could he be trying to show why Krypton's culture needs to be preserved by showing the surviving Kryptonian what the planet was like? Nice splash page and nice reveal. And it would have been a nice issue ending. But we get a couple more pages showing a red craggy alien on Krypton pulling out the Daemonite 'Horn of Confluence' and sending a signal to the 'Oracle' that Krypton is dying. So I guess there is a new and not red-headed Oracle in the DCnU. While I am sure that this subplot will be key in the future, I have to say it took a little away from the issue. The issue should have ended with the Superman reveal. 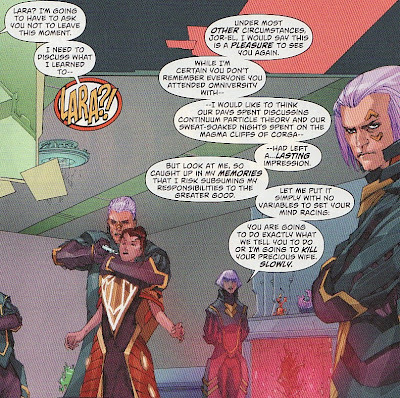 We could have used those 2 Daemonite pages bulking up the Jor-El story. And this scene could be replayed in a 2 panel flashback in the future whenever it needs to have been told. So overall I thought this was a very good but not great issue. 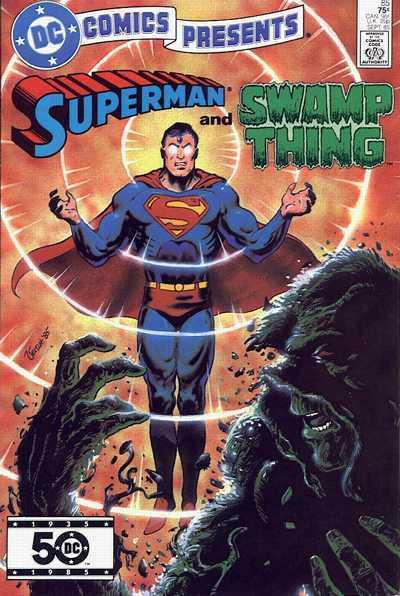 The reveals about Krypton - how powerful and scary the Doomsday cult is, the presence of an Eradicator on the planet, the creature living in the planet core - were all nice additions to my understanding of the DCnU version. The fact that Jor-El and Lara have such easy chemistry, that she is totally his equal, was also appreciated. And nice hook with Superman. 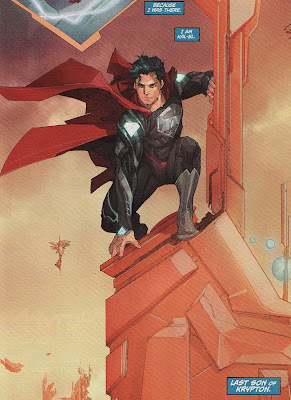 And I can't wait to see Rocafort's art on a Superman story set on Earth. His stuff is so slick. At Long Last ... More SBFFs!! After a long hiatus, the Saturday morning Cartoon Network DC Nation block is all new! There is so much goodness in this short preview. One, I love how the three look like a true team, complete with dramatic poses. In particular, Batgirl, doing her best to seem scary, is fantastic. 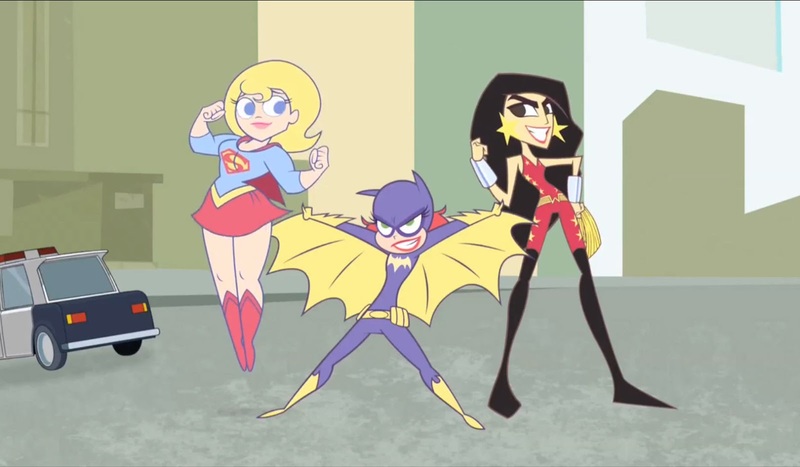 I also love that Wonder Girl is smiling, a little break from the more serious Donna we have seen early in this series. But I also love that Wonder Girl still calls the team the 'Suh-beffs'. And I love Kara's response to that team name. 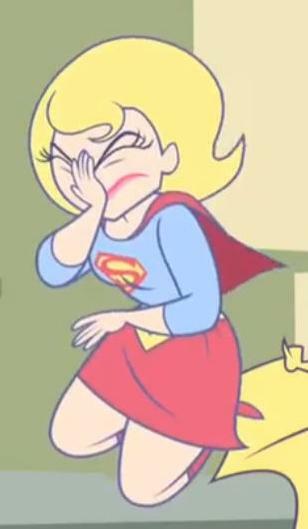 Is there anything better than a Supergirl facepalm? The release of the preview made the internet rounds yesterday, getting links and love on some of the bigger sites. Everybody seems to love this series and creator/producer Laurne Faust! Let's hope DCE does the right thing and signs on for more episodes in the future. Or better yet, how about a series?? As I have said in other places, I have been pleased with the DC's efforts in this Zero Month. The issues I have bought and read for the most part have been very good, stand alone origin stories. Sometimes, the stories truly feel separate, not part of the ongoing arcs. Sometimes they have nestled in nicely to where the title is going (Supergirl probably being the best example). But overall, I have been pretty happy because (outside of Green Lantern and Legion Lost) the issues have felt like an event, something special. Legion of Super-Heroes #0 came out last week and was a decent issue. It felt fairly separate to what has been going on in the book (save one big reveal of a 'new' origin). And since it focused on one character, not the team, and not necessarily even someone joining the team, it didn't feel like a big enough story to warrant the zero month moniker. Just like Legion Lost #0 could have been a rest issue anywhere down the line so could this. That doesn't mean this isn't a good issue, revealing some background elements of Brainiac 5's origins and just what his hubris had wrought. But would I call this issue a good 'jumping on' point? I don't think so. In fact, it sort of read like Legion Secret Origin #7 rather than a true #0. What the issue does bring is good characterization of a young Legion, one just starting. These aren't the savvy and experienced heroes we know. These are brash kids, high fiving each other, flirting in battle, and just learning to fight as a unit. Scott Kolins does the art on the issue and brings a simple throwback feel to the story. His art felt like Chris Batista's work on LSH: Secret Origin, making it feel like another issue of that title. 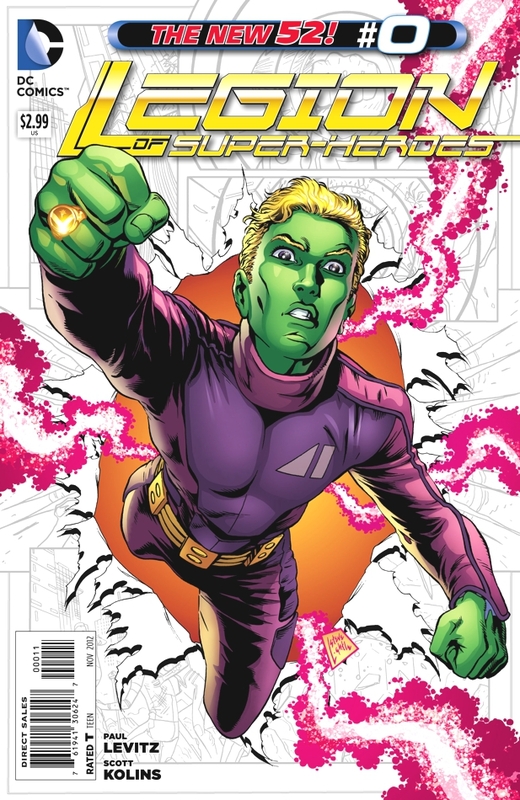 The issue takes place on Colu where the Legion has been called in to battle some robotic drones which have been released from a leftover Brainiac laboratory on the planet. The dragonfly/spider like mecha are relatively tough requiring Cosmic Boy and Lightning Lad to work together to bring them down. These are early times so it was fun to see these heroes, who we know become best friends and co-combatants, complement each other in battle. As I said, one of the things about this issue which is fun for long time Legion readers is seeing glimpses of the future in small moments. 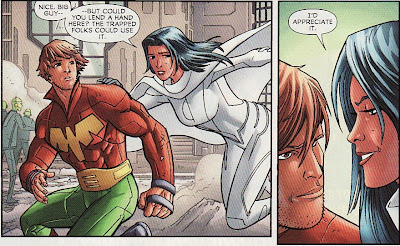 So when a flirty Phantom Girl asks Ultra Boy to help her rescue people (as opposed to slugging drones), I had to wonder if this is the first time Jo was attracted to Tinya. Even Ultra Boy is shown to be a rookie here, having trouble concentrating and switching his ultra-energy in battle. Knowing the accomplished fighter he is now, seeing these moments of indecision in him is a nice bit of characterization. So I am still trying to wrap my head around the Brainiac/Collector of Worlds creature. 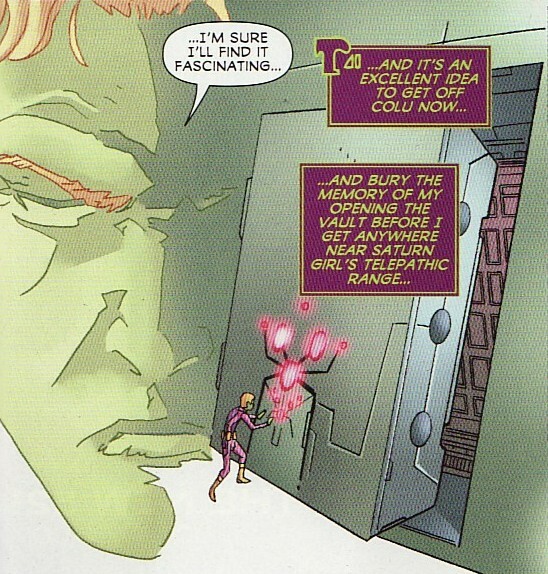 I thought in this current DCnU the Collector was a separate entity from Brainiac which was the AI of Krypton. 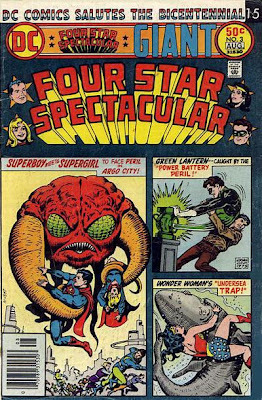 Then, following its first encounter with Superman, Brainiac absorbed/possessed/became the Collector. 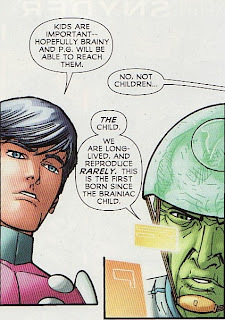 Here, the Coluan elders call the Collector by the name Brainiac and say he left Colu to gather worlds. So call me confused. As in Legion:Secret Origin, Tinya is pretty open in her attraction to Brainy. I like his astonished expression (what I can see of it). This also seems to be open to a story in the future. When did she give up trying to initiate this relationship and move on. And Ultra Boy is about as far from Brainy as you can get. Where did that come from? As I said before, the drones have escaped from some residual Brainiac facility. The lab had been sealed for generations but now someone blew the doors off and the place has come back on line. So a couple of things here. One, it looks a lot like the Legion of Doom headquarters, doesn't it? But more importantly, why keep this thing intact? Maybe to remind them of Brainiac's crime, a visible lesson? But doesn't that seem dangerous? Why not nuke it? Or enclose it in a famous Coluan force field? Or do more than just put a big wall around it. There isn't even barbed wire? The lure of ill-gotten booty is too much. A non-Coluan thief just happens to be planet-side (too much of a coincidence?) and enters the Brainiac lab to take whatever he can. The internal Brainiac AI first tries vaporize the thief but then opts to take over his body and use him. Say hello to the new Tharok! So if anyone needed a new origin it was Tharok as the 'half disintegrated' story felt dated. Heck, even the half-robotic look felt off ... surely there are plastic surgeons and skin grafts in the future. Anyways, it will be interesting to see what the new Tharok looks like (I hope some homage-like feel to the Silver Age one) and what a Coluan make-up does to his character. Another new reveal in the issue is Cosmic Boy able to make a sort of magnetic energy 'grenade' which he tosses towards the Brainiac lab, destroying the outside robots. Now I am all for more 'Dragon Ball Z' like moments in comics and this looks like a Kamehamha or maybe more like a spirit bomb. But since we haven't 'seen' this power. I don't like 'new powers' being introduced in flashbacks because then I wonder why we haven't seen them before. In perhaps the most bizarre ending to a threat, Ultra Boy literally throws the Brainiac lab into space. So ... 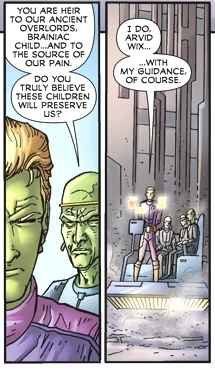 I don't know ... isn't an orbiting self-running Brainiac lab just as much a threat as a land-based one? The Tharok reveal was a nice one for a zero issue. Another reveal, the Coluans rarely reproduce. 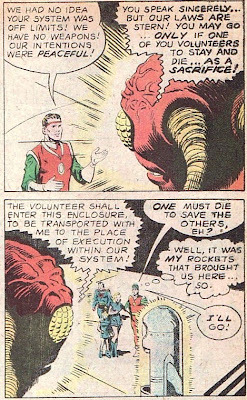 They were doing their best to protect a new Coluan infant, the first child since Brainiac 5. I would love ... love ... to read more about this. How do they reproduce (I don't recall seeing female Coluans)? Do they try? How does that effect their culture? I hope Levitz examines this some time soon. But the last and maybe best reveal (not that it was too surprising) was that it was Braniac 5 himself who opened up the facility. He has been harboring a big secret. He has released his ancestral evil. He is responsible for Tharok. Does he feel guilt? Did this motivate him to leave Colu and join the Legion, to eradicate the sins of the Pandora's box he opened? If he does feel guilt, is that what has made him veer towards insanity? Nice ending. So overall, a nice little flashback story which sowed the seeds for some future inspection. With the Fatal Five story just around the corner, I suppose the Tharok reveal will bear fruit sooner. But was this an 'event'? Did this feel 'big enough' for this month? I almost wish this story ended with Brainy's decision to join the Legion as that might have felt like an deal to validate the issue. But I think if someone who never read Legion before picked this up that they would be either unimpressed, lost, or both. Still, as a long time Legion reader, I thought this was a nice look at this Brainy's beginnings. I spent the majority of this last weekend at the Life is Good Festival nearby. They were exhausting days consisting of games, arts and crafts, food, animal shows, more food, and music. The sun was out both days and me and the supergirls probably logged some major miles as we were out walking around the festival just about 9hrs each day. When you entered the festival you were greeted by a huge chalkboard where you could write what you though makes life good. Since we came early both days, the board was empty and we could choose a great spot. On the first day, we all wrote family stuff saying life was good because of each other. On the second day, we decided to broaden things outside the usual family stuff. So right there, smack dab in the middle, I thought I would share some comic goodness. Yep, life is good because of Supergirl comic books. The responses from the Supergirls: dragons, Fluttershy, and pie. Nothing to complain about there. As usual, there are some parts of the interview that struck me and are worth elaborating on. 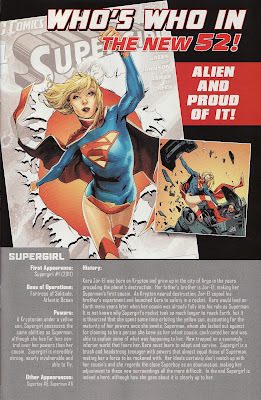 In particular, what I found interesting was the underlying current of differentiating Supergirl from Superman. Nrama: Let's talk about the origin for Kara that you guys created for Supergirl #0. The way she was rocketed from Krypton was obviously a really emotional scene, but it was very different from the way Kal-El was sent off to Earth. Was that part of your thinking, that things were much different for Kara than her cousin? Johnson: Yeah, we wanted to take advantage of the fact that, with Supergirl and her family, you have the freedom to do things that you don't have with Superman's story, because Superman's story is so iconic. Superman's Krypton story ends, traditionally, with his mom and dad holding each other, comforting each other as they send their baby away. In the same way that, with Supergirl as a character, you can sort of turn traditional "Super" mythos things on their head, we wanted to do that with her origin story here and show that instead of her parents comforting each other, watching their daughter being sent off, the family was really — even though it's a loving family — the family was really in a bad place when Kara left. And it was due to the fact that Zor-El wasn't tell his wife about what he was planning. I hope it came across in the issue that he's not being evil in any sense. He's just thinking, if I'm going to be able to save my daughter, and even Argo, I can't tell them because they'll try to stop me. I have to say it this does have a very different feel than Superman's origin. The lasting image of Jor-El and Alura is the two of them hugging each other as Kal's rocket takes off. Here we have Alura collapsed on the ground, Zor-El nursing a blast from a stun gun by his wife. Not exactly a loving farewell. Zor-El never came across as evil in the issue but more desperate. It shows how different he is from Jor-El. Zor didn't share the info of the planet exploding with his wife, he didn't share what he was doing with Kara. But it felt more like he was trying to spare her heartache than being deceitful. Still, shouldn't he share that info with her? He also is different than Jor-El in that he saved a city full of people even if it was with outlawed experiments. Philosophically, it would be good to debate whose approach to the disaster was better. Nrama: Yeah, that came across in the issue. And yet, we saw that he had experimented upon her. Is that a thread that may be picked up later? Johnson: Yeah, definitely. We wanted to answer questions in the #0 issue. We really wanted it to feel like a complete story. But we also didn't want to tie everything up with a nice bow. 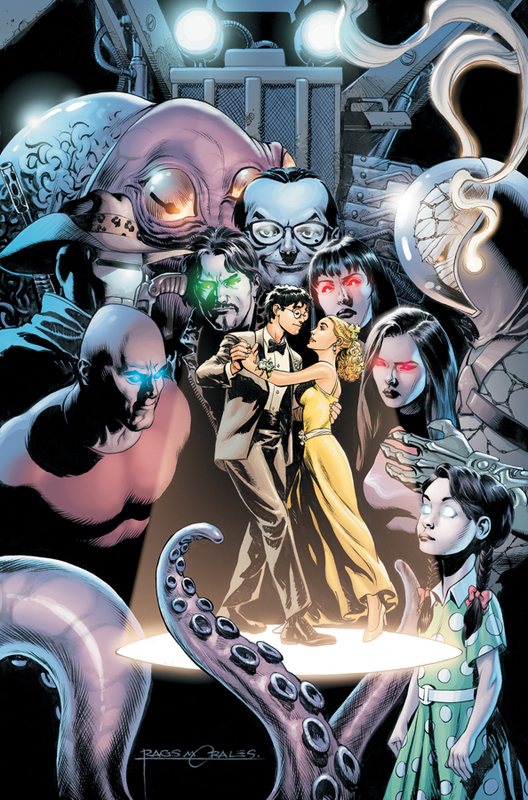 We still wanted to leave some mystery, particularly about Argo City and the Worldkillers, which are more an extension of the events of the #0 issue and less the meat of the issue itself. But at the same time, probably the largest mystery remaining is exactly what happened to Argo between the end of the #0 issue and when Kara found it in issue #5, where it's basically a dead city and to all appearances, her parents are dead as well. So while it doesn't necessarily directly effect Kara's origins, there is plenty more that happened with Argo that I want to know. What happened to the city? How did it end up around that blue sun? How did the World Killers get released? But as much as I want to read about that, I want to read more about Zor-El and Alura. Does she forgive him for all he did? Do they become estranged? Does she release the World Killers because she is so upset at what Zor was doing? Does the ground become Kryptonite like in the Silver Age? And what happened in the initial aftermath of the planet's destruction. What was that conversation between Zor and Alura like? It begs for a back-up story in an Annual or something. Nrama: With Zor-El doing those experiments, do those explain some of Kara's unique powers? Johnson: That a very good question that I can't totally answer without spoiling. But yeah, as we see in #0, he definitely had a plan to maximize the power of the yellow sun for Kara. But Kara, in her pod circling the sun, was just getting blasted for years with solar power. Now we know that there was definitely some manipulation by Zor-El. But the plan was to 'maximize' her power, not add powers. So maybe her 'solar flare' power is simply that she has absorbed so much energy she can't contain it, not that she necessarily has flame powers. Nrama: You guys have gotten to the one-year point with Supergirl, and so much of what we've seen is her feeling like an alien and alone. Is that still the theme going forward into the second year? Or are things changing as she meets people who can become her supporting cast? Johnson: We definitely want to maintain the idea that she does not feel like she truly belongs on planet Earth. You know, just because she learned what happened to Krypton doesn't mean she's immediately going to feel like this is her home. She's still adjusting. She's still absorbing what happened. But we also don't want to keep hitting the same point of feeling completely alone and alienated. That's one of the reasons we brought in Siobhan, the Silver Banshee character, and her brother in issues #8 through #10. And we're going to be seeing Siobhan in issue #13 and beyond. One of my biggest gripes about the title is Supergirl's inability to talk to people. It might be why the last two issues have been two of my favorites. In one, she is talking to Superman. In the other, while a flashback, we get to see Kara interact with other characters. It has lead to some difficulty in stories and it just slams home that 'isolation' aspect of the story. So I was glad to hear Johnson say that they don't want to keep hitting that one thread over and over. I am still hoping that her 'Fortress of Solitude' can download English into her brain. 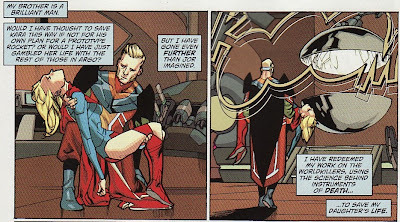 Nrama: The other big question still remaining is her relationship with Kal, and that scene in issue #12 felt very realistic and emotional, as you showed them adjusting to each other. What are your thoughts behind the way that relationship has evolved so far, and where will it go in the second year? Johnson: Up until now, Kara hasn't even known the truth about Krypton, so she hasn't been inclined to believe that this big, strapping superhero is the little baby she used to hold in her arms. In issue #13, she's going to learn more of the truth around what happened to Krypton, and that's going to start to soften her stance toward Kal. And she's going to begin to come around to accept the fact that this really is her baby cousin. Of course, accepting the fact that he's her cousin doesn't mean she's going suddenly want to hang out with him all the time. It's still such a mind-blowing and emotional thing to have to digest that we're still going to be playing that out. We don't want Kara and Kal to be at odds forever, but at the same time, we don't want to rush into the sort of familiar status quo, where they're these loving cousins that hang out all the time and have no issues between them. Well, I suppose this promises slow progress between the two characters .. and that's better than no progress. And nice to hear that won't be 'at odds forever'. These two should be close, should appreciate that the other exists, should want to be together as a family. 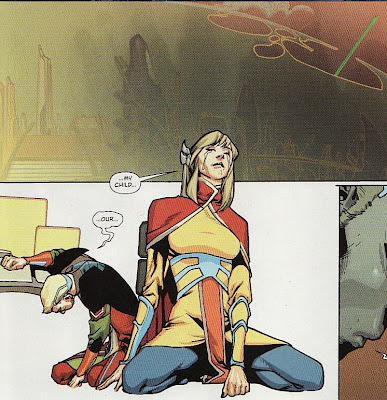 And I agree, that conversation between the two in Supergirl #12 did feel emotional. That was one of my favorite scenes in this run so far. Nrama: Is that when you become a solo writer as well, or does that start in issue #13? Johnson: Issue #13 will be my first issue as the solo writer, and Sami Basri is coming in as the guest artist while Mahmud starts work on the crossover. But Sami's done an amazing job on issue #13, and he's really been able to capture Kara's character the way that Mahmud has established it, but at the same time bringing his own cool look to it. I'm thrilled to be able to work with Sami on my first solo issue. Michael felt that making issue #0 our last co-writing issue felt like a good point for him to step aside for now. So we sort of book-ended it with issue #1 and issue #0. So starting next month Mike Johnson is writing the book alone. I wonder just how far in advance Johnson and Green had plotted. Will Green get a co-plotter credit? Congratulations to Mike Johnson for flying solo on the book. Nrama: Getting back to this battle with Simon, it feels like he's gearing up to be her arch-nemesis. What were your thoughts behind the creation of Simon Tycho as a Supergirl villain, and was it influenced by Superman having his Lex Luthor? Johnson: And most importantly, his objective is completely different from Luthor's. 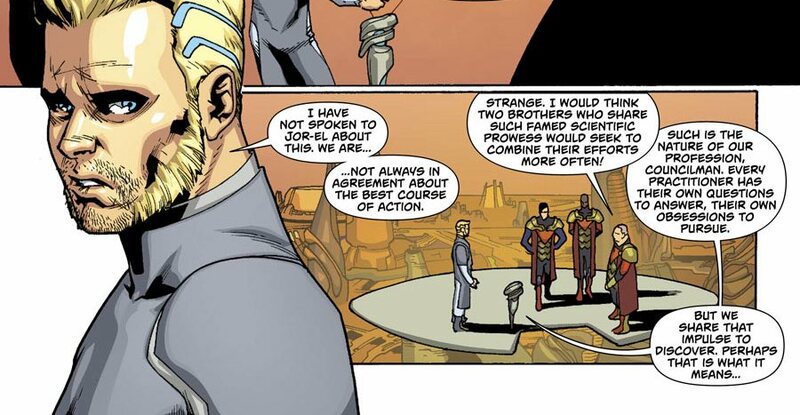 Whereas Lex detests Superman for being an alien, and Lex feels like he has humanity's best interest at heart, Tycho actually couldn't care less about humanity. He loves all things alien. That was really his job. His company was about retrieving things that fell from space and studying them and profiting from them. And Kara is just another thing for him to study and take advantage of. But Tycho essentially loves everything alien. So we already had that Jor-El/Lara's goodbye was the opposite of Zor-El/Alura's. We know that Reign is the opposite of Supergirl in terms of a similar background with a very different resulting person. Now we hear that Supergirl's arch-villain Simon Tycho is the opposite of Superman's arch-villain Lex Luthor. It does make Tycho feel fresh. That is an interesting background and an interesting way for him to view Supergirl. I just hope that this 'opposite' of Superman idea doesn't spread to Supergirl's heroism. My hope is that these differences are to make Supergirl feel like a stand-alone character and not just a female Superman. She has her own background. That said, I want the ideals and actions of Supergirl to be more like Superman's than less. How impressive will it be is Supergirl becomes a hero in the face of her more difficult origin. Nrama: We've heard a bit about H'el and the threat he represents, but what is Supergirl's role in the story? Johnson: The really interesting thing about H'el is that he has a tie to every member of the trio. For Supergirl, essentially, He'l represents an alternative for Kara to living on Earth and becoming assimilated the way that Kal has. Up until this point for Kara, it's looked like a simple matter of, well, if Krypton is gone, I guess I'll start here. And H'el offers a really compelling alternative. So my hope will be that Supergirl will realize that H'El's promises are empty, that Krypton is dead. Transforming Earth into Krypton, enforcing Kryptonian culture on the planet won't bring back her home planet, just an imitation. Nrama: I'm sure you've planned what you're hoping to do with Supergirl in 2013. 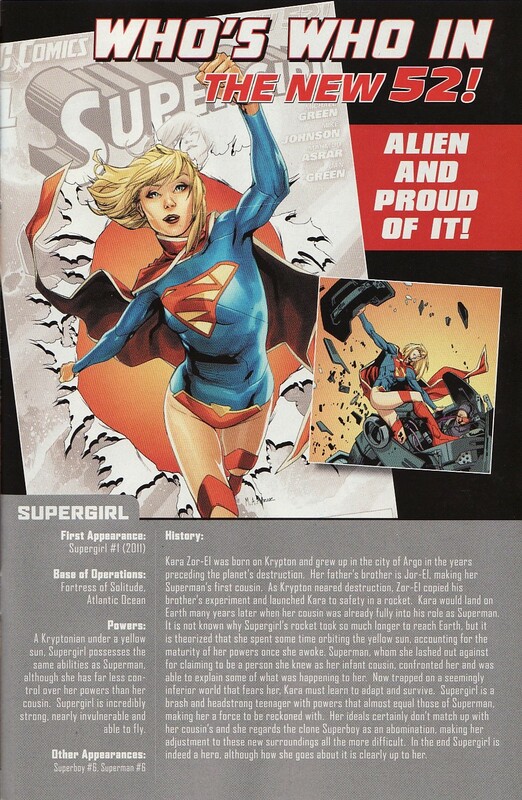 You talked a little bit about her supporting cast, and you've implied that we might see more interaction with Superman, but can you say more about what's coming for Kara in 2013? 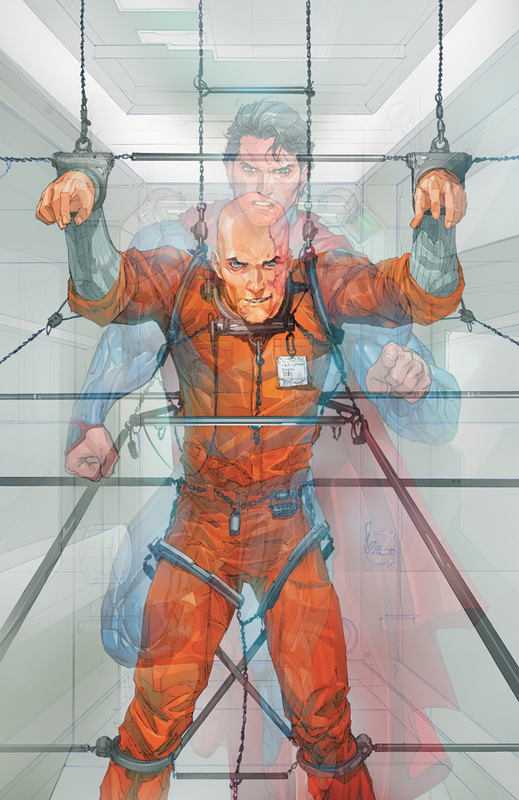 Johnson: We're seeing the second act of the Tycho story in issues #12 and #13. 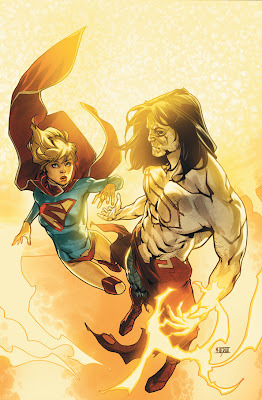 But after the Super-crossover, we're going to see the second act of the Worldkillers and really, finally answer the question of how Kara's father's experiments on her were tied to his experiments on the Worldkillers, and what that means for Kara and for her powers and for her evolution, not just as a character but literally, her biological evolution. That's a tease I can give you there. And evolution, with the Worldkillers, is key as well, because we knew that they grew from embryos to what we saw in issues #5, #6 and #7, but there's nothing to say that they won't stop evolving. And we definitely have big plans for [the Banshee] story to continue and see how Kara's relationship with Sibhan's brother will evolve. He represents the first hint of a love interest that we have for her. One of the big complaints I read in other places about this title is that the overall story is moving too slowly. So it is good to read that answers will continue to be revealed over the year. I had to remind myself that Peter David's Supergirl took a long time before his overall vision of an Earth Angel of Justice was revealed. So maybe I need more patience? As long as the there is an ending planned and each chapter is a good read with a mix of characterization and action, I suppose I should be happy and roll with it. Still, it sounds like there is a lot of interesting stuff on the horizon. It also sounds like Johnson will be softening the 'isolation' aspect of the book, slowly bringing a Superman relationship into Kara's world, and keeping her a hero. One of the things about DC's Zero Month that I have been underwhelmed with has been the Who's Who pages at the back of the issues. For one, since these are 'new characters', the histories are either vague or reprise the plots of the earliest issues. Also, the 'art' for these Who's Who pages are just the zero month covers plus a panel from the earlier issues. It would have been much cooler to have new pin-up art of the characters. Each page also does add a blurb about the character's personalities and struggles to try to provide another hook to bring in new readers. Here is the Supergirl one. Supergirl is a brash and headstrong teenager with powers that almost equal those of Superman, making her a force to be reckoned with. Her ideals certainly don’t match up with her cousin’s and she regards the clone Superboy as an abomination, making her adjustment to these new surroundings all the more difficult. In the end Supergirl is indeed a hero, although how she goes about it is clearly up to her. Earlier it says that the world fears her and she has less control over her powers than Superman. But at least it ends on a high note. 'Supergirl is indeed a hero.' It is crazy that in this current market world you have to say that outright but there it is. I also don't know if I am crazy about the tag line 'alien and proud of it'. 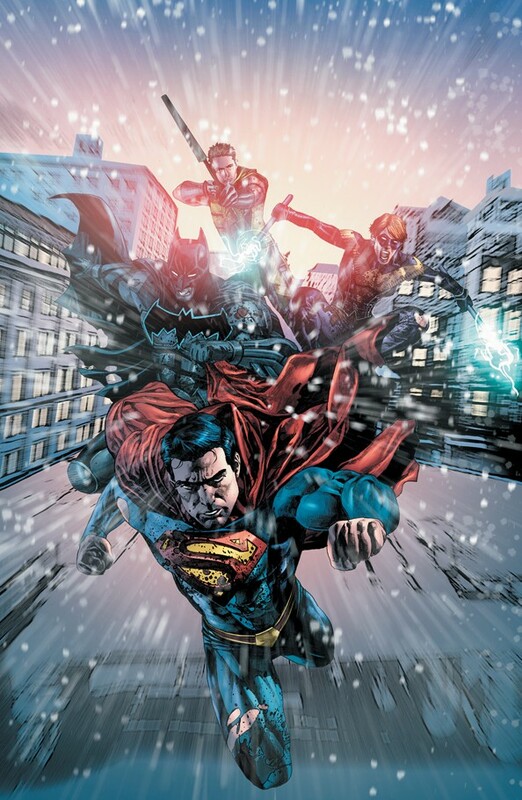 I have been pleasantly surprised with DC's Zero Month finding most of the issues to be solid origin-based stories and decent jumping on points. But no title seemed more geared for a zero issue than Supergirl; the details of Kara's trip to Earth have been a mystery since the beginning of the book. With this week's Supergirl #0, we finally get some answers ... and a couple more mysteries. One of the things that I have commented on ad nauseum here has been the difference between the Supergirl character in the book and the one presented in publicity by DC's PR staff and editors. While the publicity makes her sound like an angry loner with a mean streak, the book itself shows a character with a deep seeded sadness. Sure, she has occasionally exploded (literally) but she has always seemed to have the right motives, the desire to help others. 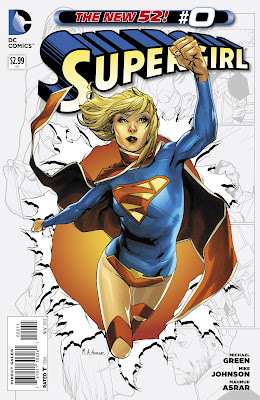 In Supergirl #0, which takes place on the last days of Krypton, we get a sense of why she has that core, who she was in her own environment, and basically the type of person she is. I liked what I saw. On top of that, we get a better sense of Zor-El, his abilities, his obsessions, and his overwhelming love for his daughter.Thankfully, there doesn't seem to be madness in him, just desperation. And we also see the lengths Alura will go to in order to protect Kara as well. Prior glimpses of Alura made her seem like a rigid traditionalist with a strained relationship with her daughter. Here we get to see a loving mother trying to protect her child. On top of this characterization which really builds a foundation for the Supergirl character, we get answers. When was she rocketed? By who? And who shot Zor-El? There are some minor details which I don't know if I have wrapped my head around yet but overall this was a very good issue. The creative team of Mike Johnson, Michael Green, and Mahmud Asrar just deliver here. On to the details ... and since this is a big issue with big revelations, this is a long review. The issue starts in Zor-El's secret lab, a lab hidden from the Science Council, where he is running experiments which push the boundaries of the Council's ethics. So already we know something about Zor. He is willing to do what he thinks is right even if it flies in the face of authority. That sort of determination is something that we have seen in this Kara ... heck in the best of all incarnations of Supergirl. I thought this was a nice little way of showing where Kara gets some of her internal strength. Now, preparing to do whatever necessary to save your daughter is one thing. To experiment on your teenage daughter without her consent is something else. So maybe there are some boundaries that shouldn't be crossed. The words here have to be deliberate. 'Code Matrix' has to be some subtle homage to the Matrix Supergirl. It also implies, especially given this is the World Killer lab, that this Kara was altered by these experiments. So maybe these new powers - the super-intuition, the corona wave solar flare, the combined vision - isn't simply because female Kryptonians process yellow sun energy differently. Maybe she has been enhanced. I have to admit ... I don't know how I feel about this quite yet. Zor-El knows that the planet is doomed. But he can't come right out and say it. Why incite panic? Or risk his own freedom to do what he thinks is necessary? Instead, he has to act somewhat in secret to try to save what he can. With the blessing of the Science Council, he has placed 'generators' around Argo City. We know those are really force field generators, designed to save Argo. Again, this shows a sort of headstrong 'I know best' attitude in Zor. There is always a lot to compliment in Mahmud Asrar's art but you can just feel the fatigue and desperation in Zor-El here. He is racing against the clock and it shows. As I said before, one of the things I loved about this issue was seeing Kara in a comfortable environment. It gives me a better sense of who she is. So despite the ongoing feud between Zor and Jor, she still visits her aunt and uncle, still plays with her cute little cousin. She has a sense of family and loyalty. She clearly loves little Kal. So she has a strong emotional core. Interestingly, we also hear her comment about bickering classmates, equating the Jor/Zor dispute to 'mean girl' nonsense. But that statement also makes her sound like she is simply above all that. So there is an implied maturity here. But that fraternal disagreement is based on Zor's experiments. 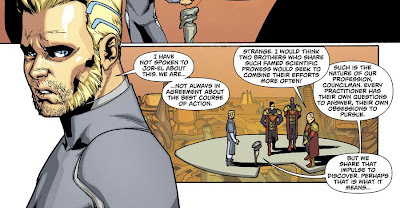 Jor-El doesn't approve of things he has seen Zor doing (the world killer stuff, I suppose). 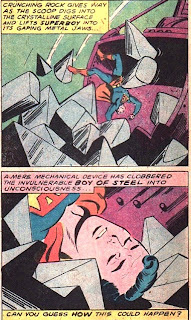 At home, Zor-El continues to push himself to the limit. Time is short and he needs to get everything ready. He is curt with Alura, hiding his plans with Kara and the planet's destruction even from his wife. So Zor is complicated. He isn't the sunny purely good guy we saw with the last Supergirl. He keeps a phaser set on stun by his side because scientific caste members have been attacked. There is a lot to digest here. First off, the scientific caste sounds a lot like the science guild from prior Krypton culture. I am glad that the super-books are maintaining that part of Krypton's history. Second, these attacks are probably from the 'doomsday' anti-science cult we saw in Superboy #0. But lastly, you never see a gun in the first act unless it is going to be fired in the third. With the clock ticking down, Zor takes Kara to his main lab in Argo. Alura, who had been curious about Zor's research, discovers that he has been using Kara as a guinea pig. 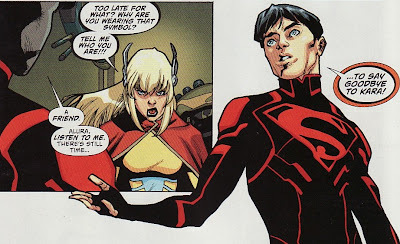 On top of that, she is startled when Superboy appears telling her there is still time to say goodbye to Kara. Suddenly there is a new mystery in this book. How the heck did Superboy end up here. 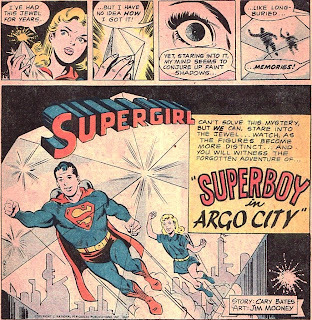 It makes my review of the Superboy on Argo City seem prescient! Anyways, we have already seen Kara in the crowd shot of Superboy's origin in Superboy #0. Now this. Somehow these two get to be part of each other's origins even if it means time travel. Hopefully this will be spelled out in H'El on Earth. But more importantly, what an interesting message from Kon. He doesn't want Alura to miss this moment, he calls Supergirl Kara. He seems to ... care! What an interesting future moment for us to peek at knowing what Superboy is going through now, knowing what Supergirl thinks of him now. 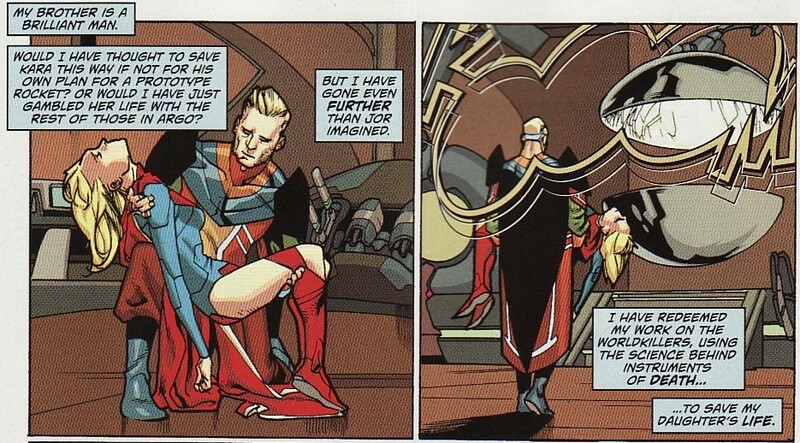 Zor-El meanwhile has his rescue of Kara timed to the second. 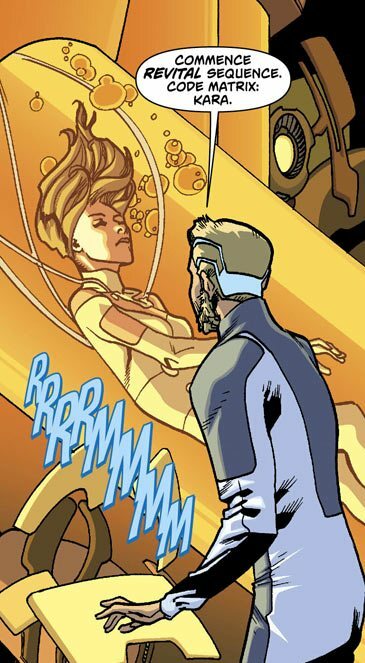 He takes her to the lab, has her get into her 'family crest' outfit, and shows her the pod she is sent to Earth in. I know that I have been talking about this solid emotional core and maturity that Kara has shown but this panel reminded me that she is still an adolescent. But this panel, so wonderfully drawn by Asrar, speaks so much. The beaming smile, the shy knocked knees, the brandishing of the cape. This sort of childlike joy she evidences, just from wearing this outfit, reminded me that she isn't a fully formed adult despite her upbringing and set of values. She is in many ways still just a kid, learning about the world. But the world is literally crashing down around them. For some reason, presumably because he has drugged her, Kara passes out. Zor has the time to tell her what she is doing and she begs him not to send her away. I thought this was a good moment for the two. The father who loves his child so much he has to send her away to protect her. It isn't an easy choice; he is weeping. This is a different portrayal of Zor-El then we have seen recently. He resides somewhere between Kelly's insane murderous Zor and Gates' perfect father figure. This is a complicated guy stuck in a bunch of no win situations. I do think his heart is in the right place. We have surmised in the past that the raw power of the World Killers is what powered his generators, made the force field. He basically admits it saying that he has redeemed himself, using their power to save lives. But he also says it is saving Kara's life. He must have altered her genome, using the work he did on the World Killers as a template to increase Kara's capabilities. I have to say, I am still on the fence about this one particular detail of her history. I'll need to see it play out a bit more before I decide if I like it or not. Also, in a nice piece of symmetry, we get the reverse angle of the speech Supergirl heard off the sun-stone crystal in Supergirl #5. We see Zor recording it. We know that recording ends with Zor-El being shot. I had always assumed it was a kill shot. But that gun from Act 1 was a stun gun. And it is Alura who pulls the trigger. 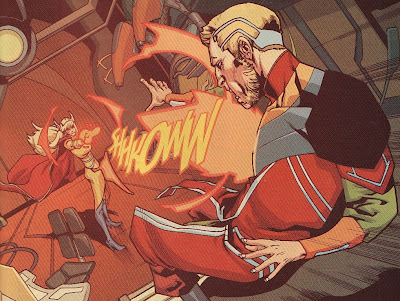 Back in my 'who shot Zor-El poll' I listed her as a suspect and the person I hoped would not have pulled the trigger. (Of course, back then I thought it would make her a murderer.) Now knowing this simply stuns him, I suppose it is semi-justified. She has learned that her husband has experimented on their child and is planning to rocket her off the planet. I can understand why she would be angry and try to do everything in her power to stop him. Congrats to those people who voted for her! Of course, she arrives to late. The pod speeds off just as Argo's shields go live ... just as the planet explodes. I love this image of Alura, simply defeated, ragdoll-like in her sorrow. We have always seen Alura in a position and posture of strength. To see this image of her humanizes her. So a very solid and intriguing origin story here ... one that answers a lot of questions. We know now that Supergirl was rocketed at the same time as Kal. Now why she would orbit the sun, or finally break orbit and land on Earth ... I don't know. We know that Argo survived. It must have been Zor-El (or perhaps Alura) who built the wormhole gates between Argo (as it orbited the blue sun as seen again in Supergirl #5 ) and Earth. Perhaps he was hoping to reach her, be reunited with her. And this is why Reign says the lab she awoke in was in space. It was the Argo lab she was in, powering those generators. We know why Supergirl thinks she was on Krypton just the day before. We know how she got into her uniform (I guess some short term amnesia about her conversation with Zor is expected). And most importantly we have a sense of who she was on Krypton. Mahmud Asrar's art is supreme in the issue especially in the characters' expressions, magnifying the power of each scene. Now can I deal with her amplified genome? And how did Superboy get there? What I really want to know is what did all of you think? With a number of the first wave books hovering with low sales, it is natural to wonder if more cancellations are around the corner and a number of books have a 'big finish' feel to their solicits. That said, only one book has been labeled 'Final Issue' - G.I. Combat. I was worried a bit about Demon Knights until Paul Cornell and Bernard Chang went onto Twitter saying the book is in no danger. As for the Super books, it will be H'El on Earth time so these solicits are interesting. • H'el takes Supergirl on a whirlwind tour of Earth and even space, all in an attempt to sway her to his cause. • On the surface of the sun, Supergirl must make a choice: Earth or H'el? We knew all along that Supergirl might be sympathetic to H'El's alleged pro-Kryptonian stance on things. My guess is she'll make the right choice and side with her new home. Great cover by Asrar here. 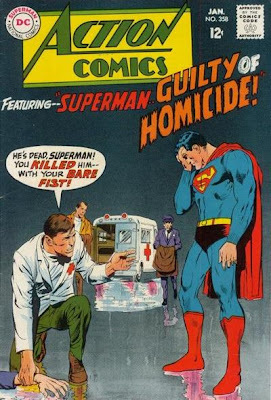 • Superman is on trial for his life – and the jury is the Anti-Superman Army! It's the ultimate villains springing the ultimate trap at the end of time itself! • And the mystery that has built since issue #1 is resolved as the Little Man's true identity is revealed – with grave consequences! This issue will have 4 covers! Crazy. And one by Fiona Staples! Fantastic! I have enjoyed Action a lot in the new 52. I really hope that Morrison is able to bring this thing to a satisfactory close. But this cover and the solicit of a fight with the Anti-Superman Army and the Little Man sounds great. He has to be some sort of 5th dimensional imp, no? Another nice cover here by Morales. • Superman, Supergirl and Superboy are together at last! And it's a disaster! • Superman and Supergirl have very different opinions on how to confront H'EL! And in order to stop a Kryptonian, Kal-El must seek help from Lex Luthor, the one person who does nothing but think about that! The superfamily 'together at last! And it's a disaster!' Yeesh. I hope things eventually get better. 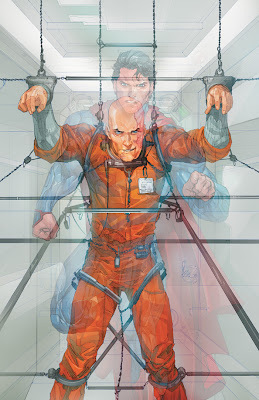 Since we haven't seen Luthor since the early issues of Action, I am interested to see what his character is in the 'present day'. Super-genius in a battle suit? Evil CEO? Both? The idea of a hero asking a villain for advice is a well traveled road but Superman asking Lex how to get rid of a Kryptonian?? Should be good. My only hope is that the super-family all emerge from this arc as more heroic. I don't need them more feared or more isolated. • With Superboy dying from the wounds H'el inflicted on him, they may not have time for a heart-to-heart! So that is the old school jean wearing Superman confronting Superboy. So maybe there is an element of time travel to this thing. Maybe that is truly Kara back on Krypton. 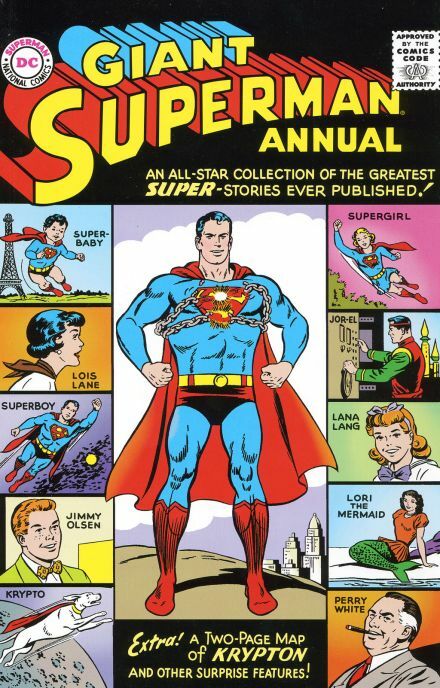 I like the coloring on this cover, the blue energy giving Superboy a more classic appearing costume. 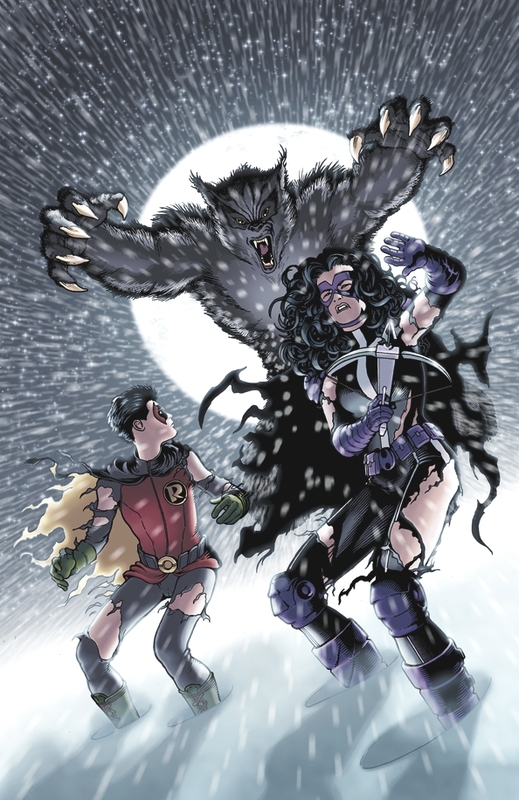 • Robin begrudgingly helps Huntress track down the threat to Wayne Enterprises, but little do they realize that threat is actually tracking them! • Meanwhile, Power Girl continues to explore the connection between Earth 2, Apokolips and this Earth, only to find herself in a stand-off with...a bunch of heavily armed 10-year-olds?! Boy Kevin Maguire loves to draw shredded costumes. Reminds me of the Cat and the Bat storyline in Batman Confidential. While Huntress gets the cover treatment, I am more grabbed by the PG portion of the solicit. armed 10yr olds? Has to be some version of the Newsboy Legion, right? • The "Detective" epic reaches its heartpounding conclusion! • BATMAN and GREEN ARROW versus a Prankster-controlled MISTER FREEZE! • SUPERMAN versus PRANKSTER for the fate of METROPOLIS! From Worlds' Finest to a book that sounds like an old school World's Finest! Batman and Superman squaring off to fight a super-villain team-up! Sounds good to me. I liked ChrisCross' work on the last Smallville so glad to see him penciling again. Wonder if Pere Perez is off the book. And when will the 'Crisis' part of the season start to happen? • Who are the mysterious alien menaces with the super family's powers? • What is that strange alien symbol? What does it mean to Superman – and to Krypton? 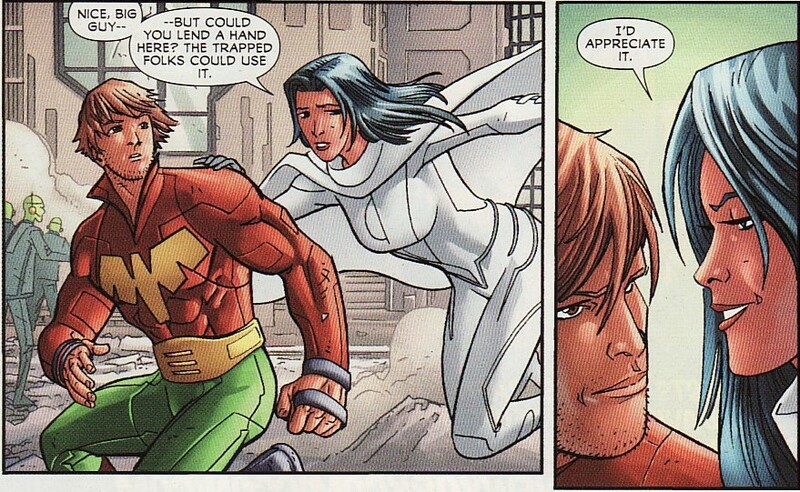 Now one of the things I loved about Tiny Titans was the way it inserted and often lampooned mainstream DCU concepts. Looks like Superman Family Adventures might do the same. There is no doubt this cover references the initial arc of the Perez new 52 Superman story. 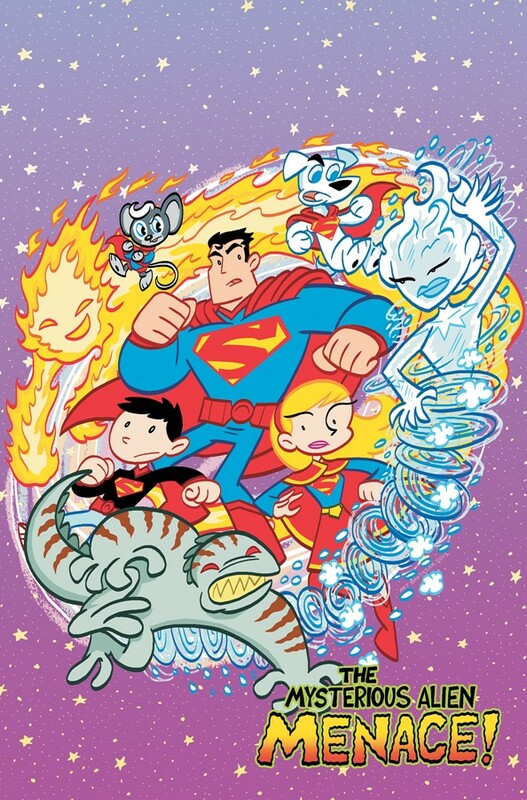 Will Art Baltazar and Franco be able to make it make any sense? Luckily it looks like the whole family will be involved. I am hoping that H'El on Earth eventually brings the family closer. But in this DCnU, who knows. It is pretty clear that in the upcoming H'El on Earth storyline that there will be conflict between Supergirl and Superboy. In fact, I think that their interactions is going to have significant ramifications in how they relate to Superman. So I figured, in a Morrison-like twist, that I would review the 'other' first time the two met, here in Supergirl's story in Action Comics #358. 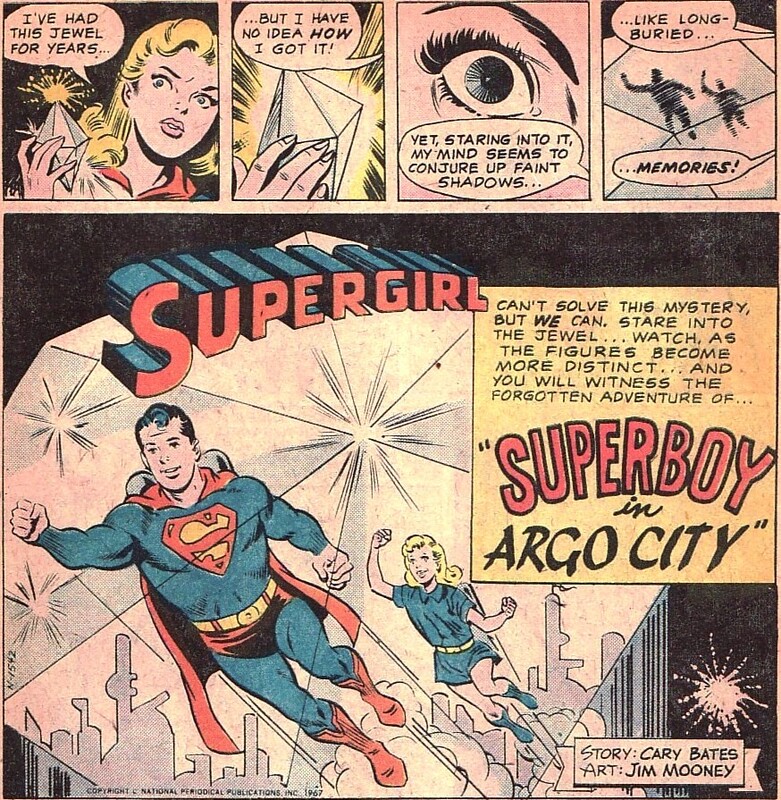 Superboy in Argo City was written by Cary Bates and drawn by Supergirl artist extraordinaire Jim Mooney and is one of those charming if somewhat dated Silver Age stories filled with twists, turns, and crazy plot lines. But this story takes place in an interesting time in DC continuity. Krypton had exploded over a decade prior. Argo City is out in space and doing fairly well, to the point that families are growing. Kara is born on Argo; it is the only existence she knows. That means Superboy was active on Earth and simply unaware that a chunk of Krypton and a city full of his people were out there. Given his intergalactic jaunts and his interaction with aliens, it is surprising he didn't hear about it. 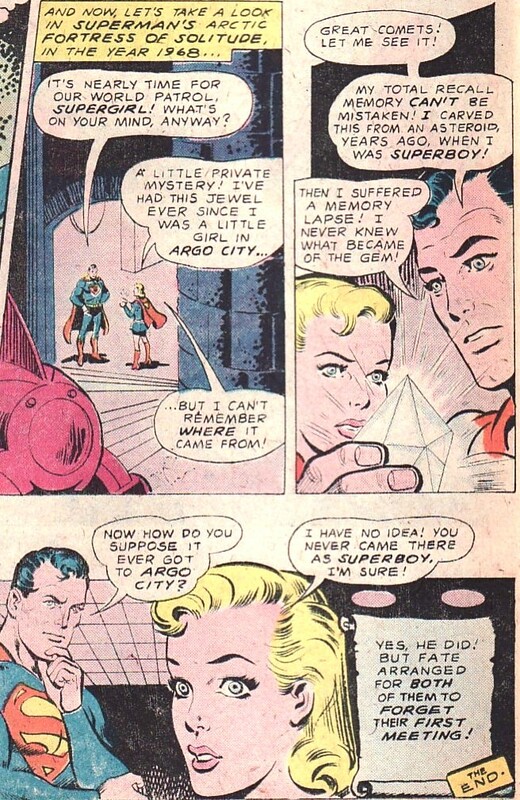 Of course, we know that Kara is rocketed to Earth as a teen and tells Superman about Argo. He can't learn about it until then. So Bates decides to spin a crazy tale where the two cousins meet on Kara's home turf. And this unknown story is told to us when Supergirl wonders where she got that jewel she brought with her to Earth. 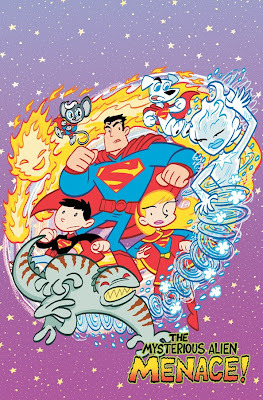 The story begins with Superboy out in space exploring. He finds a giant cosmic jewel and cleaves and carves a chunk to present to Ma Kent. But while polishing the stone, he is hit over the head by a sort of space front-loader which scoops up his unconscious form. So what is this machine? And how could it knock him out? 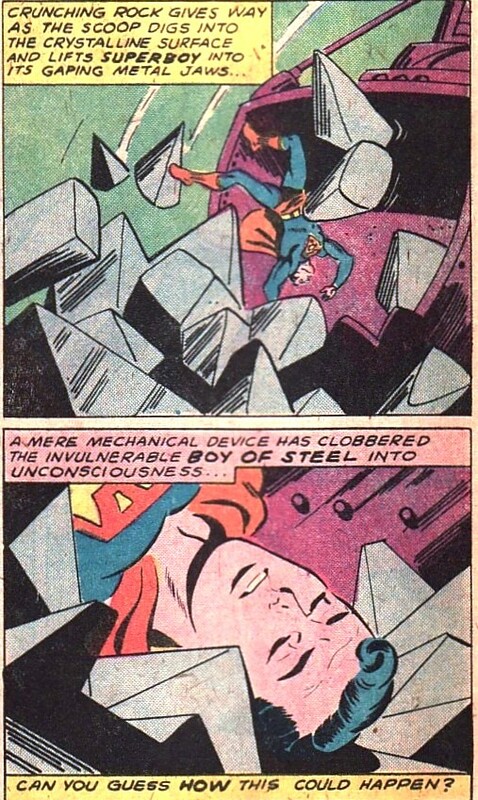 It turns out the rock collecting probe belongs to Zor-El. He sends these things out to explore and learn about the space he is. And, as is usually the case in the Silver Age, it happened to be right where Superboy was. 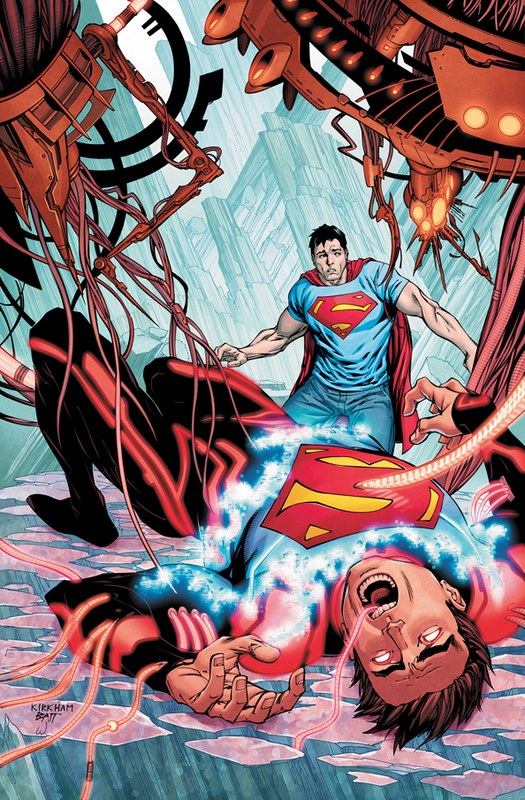 Being a 'Kryptonian' machine, it is strong enough to hurt Superboy. Set on autopilot, the probe returns. And there is a young Kara, helping out her busy father by checking on things. 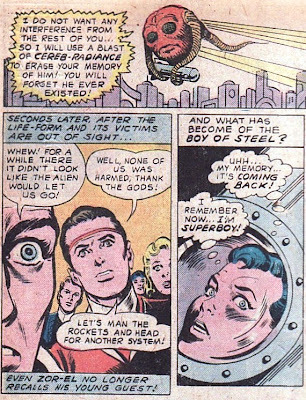 And there inside Zor-El's machine is Superboy! I think it is sort of interesting that Zor already trusts Kara with such things. She must be pretty advanced, something we see in her adventures where she is a pretty decent scientist. Reading this, Kara strikes me as probably 8 or 10. Superboy seems like 15 or 17. So the age difference isn't what I would necessarily expect to see given how they act in Action #252. 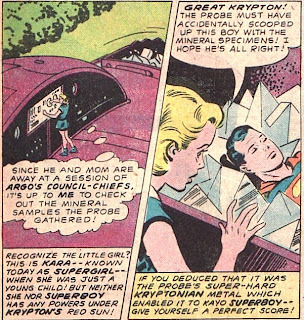 On Argo, Superboy is powerless. And, like a bad TV show, he has amnesia. He has absolutely no recollection of who he is or how he got there. So this obviously means this is before Zor-El has discovered Earth with his space telescope and learned about Superman's existence. In fact, that second panel makes it seem like he isn't even aware that Kal has lived. Kara and Kal become friends and even have some 'super-hero' adventures, flying around Argo in jet packs and saving some pet birds. Ah ... these were simpler times. Happy to have a home and a family, Superboy gives Supergirl the jewel he was going to give Ma. And so we know how Supergirl ended up with it. I mean, Supergirl has been so swell, he had to give her something. This was also a time when Argo City actually had rockets and were tooling around the universe. (At some point, the rockets are destroyed leaving the city to drift). Zor-El keeps hoping he'll find a planet where the city can land. 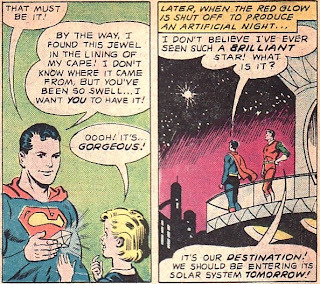 The next solar system they encounter is your standard bizarre Silver Age one. After crossing the boundary, a powerful alien arrives saying that trespassers are not allowed. It will let the city go if someone will volunteer to accept the punishment for this indiscretion ... execution. Sheesh ... talk about frontier justice. Zor-El says he'll go but Superboy shows just what a hero he is. He jumps into the death pod and gets taken away. And then, in a classic twist, the alien decides that he doesn't want interference ... revenge ... and so he zaps the whole city with "cereb-radiance", a sort of amnesia ray. Thus, no one on Argo ever remembers Superboy existed so they can't try to avenge him. 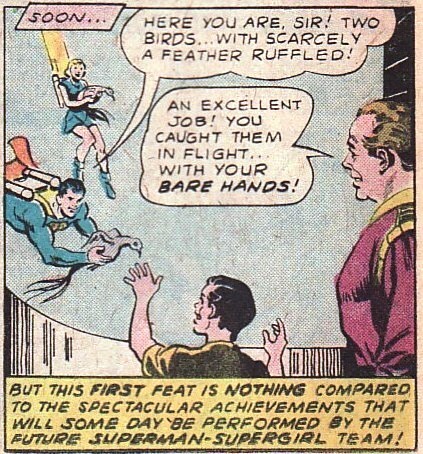 And so now we know why Zor-El and Kara don't remember ever meeting Superboy. The aliens still take him away in order to kill him. But it turns out that where they are bringing him is a yellow sun system. Suddenly re-powered, Superboy is able to escape the death pod and his execution sentence. Man, Argo City was that close to a yellow sun (something which they eventually do encounter). Yet, despite regaining his powers, he doesn't regain his full memory. His time on Argo remains gone. 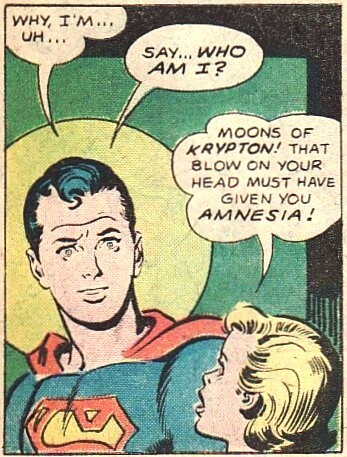 And so now we know why Superboy doesn't remember his time on Argo. That is a whole lot of selective amnesia for one story. Incredible. But that jewel remains. Supergirl has no recollection of how she got it, but remembers it from Argo. And Superman remembers carving it but can't recall despite his super-memory how he lost it! It will forever be a mystery and so the two cousins don't remember how they first met. What a crazy story! Classic DC Silver Age! In a Supergirl collection, I would rank this issue of moderate importance and only for the historic element of the cousins' meeting. Also, stories of Kara's childhood are pretty rare so it is a great issue to see what she was like as a school age little girl. Mooney's art has a sort of simpler feel to it in some places and even felt Ditko-esque in a couple of panels. The issue itself will probably run anywhere from $15 to $50, and probably even more in high grade. The story was also reprinted in Four Star Spectacular #3, which sports a decent Ernie Chan cover. Probably a rarer find than the Action issue but also cheaper. But the hook of this issue is seeing that young Kara, already intrigued with science.